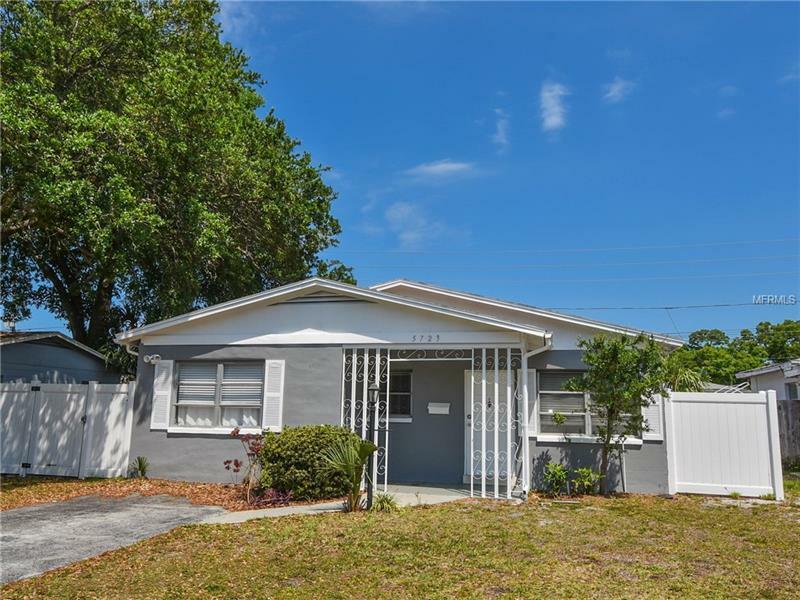 Quiet residential neighborhood offers a renovated, 3 bedroom, 2 bathroom, block house in the heart of St. Petersburg. Property features a lovely covered front porch, a side lanai, and a rear covered patio. As you walk in you will notice bright and spacious living spaces, and wood laminate flooring. The updated kitchen features stainless steel appliances, and the bathrooms are updated as well. You may access the large back yard through a slider to the side or through your inside laundry with washer and dryer included. Once outside you will notice a large vinyl privacy fence, and paved alley access. Plenty of room for a pool, a boat or RV. This home is walking distance to many amenities such as Tyrone Mall, schools, churches, park, restaurants, and is an easy commute to Tampa, Clearwater & St. Petersburg. <30 min to the airport, 10 min to the beach, and 10 min to downtown. Don't miss it. Call today.